In my old apartment, my room was obviously slapped on the back of the house, at an angle at that. A pencil rolled right off my desk, and I had to put risers on only one half of the bed to avoid hideous back problems. There was a window into the kitchen and another window that had been painted over. Two years in, I figured out a use for this useless window. 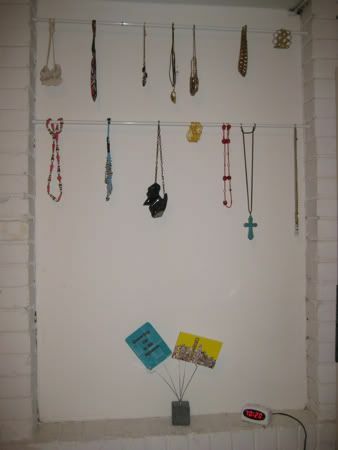 Just added a couple spring-loaded curtain rods, so my jewelry could be on display. I don't like the effect as much here in the new place, but it's still useful. The curtain rods fit nicely in a small corner of my bedroom. I'm scared to nail holes in the pristine walls here, but one or two won't hurt, right? 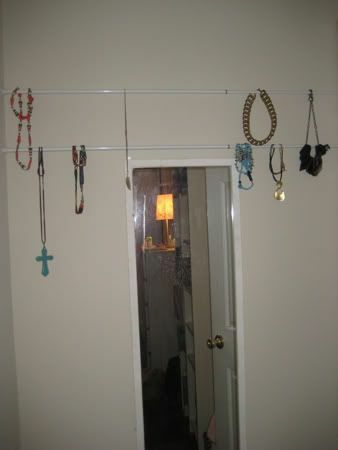 It might be cool to wrap the curtain rods in ribbon, maybe I will try that to make it look a little prettier. Posted in Style and tagged with Home Design. August 14, 2011 by Adele Chapin.